Featured Image: The renminbi is the official currency of the People’s Republic of China. The name (simplified Chinese: 人民币; traditional Chinese: 人民幣; pinyin:rénmínbì) literally means “people’s currency”. Renminbi banknotes 100, 50, 20, 10, 5, and 1 yuan (2005 series). Credit: Uploaded by Heilme Source: Wikipedia (Fair Use). For the first time in decades, the U.S. is no longer the largest economy in the world, and China has become number one, the International Monetary Fund says. The IMF recently released the latest numbers for the world economy, stating that China will produce $17.6 trillion in terms of goods and services– compared with $17.4 trillion for the U.S. 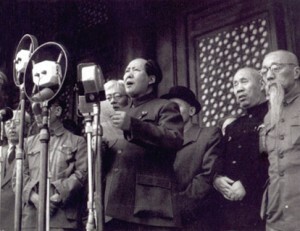 Image: Mao Zedong founding the People’s Republic of China in 1949. Source: Wikipedia. Credit: Uploaded by Matanya (usurped) (Public Domain). A good friend of mine brought this Youtube channel to my attention. Watch it to the end, please. WARNING: graphic animated violence, expletives of all kinds, and concepts unsuited to a sheeple. This episode is about gun control and how the controllers slowly and gradually bend the will of people, including Americans, to the idea that “government” will take care of all of us, all our needs, and all our security. The US government is stockpiling nuclear warhead components so that they can be used to destroy asteroids if need be, according to a report from the Government Accountability Office.